The first quarter of 2014 has proved to be very interesting with results that were significantly different than 2013. For example, the total return of the S&P 500 for the first quarter of 2014 was 1.8%. This is a far cry from the almost 10% rise in the same quarter of 2013. As of March 31, 2014, the Dow fell 0.7%—its first quarterly decline in a year. The NASDAQ ended the quarter up with a gain of 0.5%. Contributing to the fall were concerns about many stocks’ rich valuations and lawmakers’ questions about high drug prices. During the quarter many stocks struggled to maintain the upward momentum of 2013, though they remained near record highs a majority of the past three months. Another area of disappointment came from new-home sales, which dropped by 3.3% in February. Higher mortgage interest rates and poor weather conditions seemed to contribute to the decline. · Real GDP rose higher than its earlier estimate, chiefly due to consumer and business spending. · The Conference Board’s Index of Consumer Sentiment climbed to 82.3 in March, its highest level in six years. · Orders for durable goods also increased, along with personal income and spending. 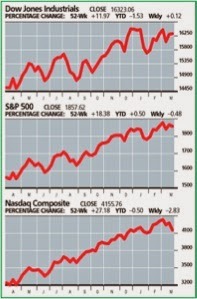 The U.S. equity markets provided strong gains in 2013. Despite worries about Fed tapering and higher interest rates, Washington’s dysfunctional behavior and a modest economic recovery, the S&P 500 rose almost 30% for the year. 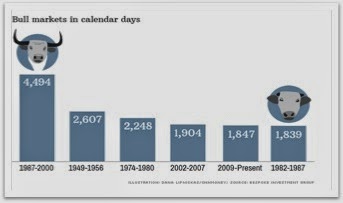 However, many investors started speculating about when the next correction would arrive and what could cause it. The U.S. economy surged in the last quarter of 2013 and appears set to maintain that momentum. Even with this positive outlook, it shouldn’t surprise any investor if a market correction comes along and produces a decline of 10-12% and lasts up to eight weeks or longer. One of the most obvious triggers for a correction could be a stalling U.S. economy. The economic data seem to show the economy continuing to recover at a modest pace, but there are still significant pockets of weakness and things could potentially change rapidly. Another potential risk is high expectations for corporate earnings in 2014 and beyond. Many economists are skeptical that earnings growth can meet projections. If the market comes to the conclusion that the economy is not going to see that kind of earnings growth, this could be the catalyst that might cause a major correction. Also, an increase in the costs of raw materials, labor or interest expense could pose a threat to profit margins. If profit margins slip, current stock evaluations might prove unsustainable. Outside factors are the most likely threats to the U.S. economy. Europe is a long way from resolving its problems or even being on a long-term path to recovery, and it could spin out of control at any time. China is changing its policies and those changes will affect the global economy. There are several significant emerging economies that could have debt payment or economic problems. A wide range of global political issues may also result in a crisis or war that could unsettle markets. Potential problems will always cause concern for the equity markets, but this does not necessarily mean you should constantly alter your portfolio. A prudent approach is to invest in a manner that will not cause you to be up all night worrying about your investments. Long-term treasury interest rates moved a little lower at the end of the quarter. Many investors did not expect this when the Fed began to cut back on its bond-buying program. Although treasury rates have dropped, mortgage interest rates moved higher. This movement might have put a chill into new-home sales. Many investors are concerned that housing might not prove to be the investment that it has been in the past. The bond market continues to confuse many investors. Since the Fed announced the tapering, there has been an expectation that interest rates would rise. 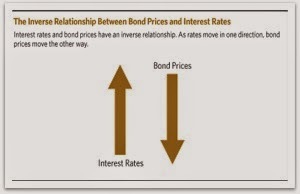 However, bond prices are actually higher and interest rates are lower. Investors might still put their money into long-term bonds for safety. In fact on several occasions, bonds delivered strong returns. Currently, though, with market interest rates at such a low level, it’s difficult to even think that bonds will be able to offer most investors that kind of return at this time. Focus on your own personal objectives. Revisit your personal timeline. Understand your commitments and categorize your investments into near term, short term and longer term time horizons. We can easily help you with this. Don’t try to predict the market. Ben Graham, father of value investing, has Warren Buffett as one of his most well-known disciples. Graham often said, "The individual investor should act consistently as an investor and not as a speculator." You are an investor, not a fortune teller. Base your decisions on facts, not speculative forecasts. Discuss any concerns with us. Our advice is not one-size-fits-all; we will always consider your feelings about risk and the markets as well as your unique financial situation when making recommendations. For example, given today’s stock and bond valuations, and the expectation of many economists that interest rates will rise, “there’s nothing wrong with pulling 10 % off the table and sitting in cash,” says James Stack, a market historian and editor of the Invest Tech Research Newsletter.